Fourth Row Center: Film Writings by Jason Bailey: On DVD: "Man on Wire"
Marsh’s film, which utilizes new interviews, archival footage, and stylish black-and-white reenactments, is ingeniously constructed; it begins with Petit’s haunting words, “In the middle of the night, I wake up with this nightmare…” and plunges us right in to the morning of “the coup,” as it is called. From that point on, the film runs on a pair of parallel timelines: one, the story (in personal history and logistical planning) of how he got to that wire, and the other, a point-by-point explanation of exactly how they pulled it off. The biography and background is as skillfully assembled as any smart documentary. The reconstruction is as suspenseful and enthralling as a good heist picture. That it manages to extract some tension from a story we know the end of (I don’t think I’m spoiling—the posters show a famous photo of Petit on the wire, and besides, it wouldn’t be much of a movie if they hadn’t brought it off) speaks to the skill of Marsh’s filmmaking; I can seldom get behind reenactments in any documentary that isn’t directed by Errol Morris (too often, they reek of bad television), but these sequences are briskly cut and beautifully shot, from the vivid imagery of the security guards’ languidly moving shadows to the dreamlike image of the wire plummeting out of their grip. Like any quality documentary, it tells a good story intelligently (and uncovers valuable history—I had never heard of Petit’s feat until the film came out), but the thriller elements of the parallel timeline help give Man on Wire a quality often elusive to non-fiction films: It’s fun to watch. Petit himself also has a lot to with that. One of the most important elements of an involving doc is that it includes good natural “characters,” and the animated Frenchman certainly qualifies. He is a robust, excitable type, full of vigor and enthusiasm, and he attracts an entertaining group of followers and accomplices—many of them given caper-picture titles like “The Inside Man” and “The Australian.” One of them, American Jim Moore, says of his participation, “It just sounded like a really fun adventure,” and that just about sums it up. Thanks to a remarkable library of old documentary footage, shot by film students and friends, we see him training for and executing his two big run-ups to the WTC walk: a 1971 walk between the two towers of the Notre Dame Cathedral, and his 1973 walk above the Sidney Harbor Bridge in Sydney, Australia. But that was all leading up to that August morning in New York, and for both Petit and the film, it’s a magnificent payoff. The footage and pictures (particularly as they are edited with the lovely score) are remarkable, but just as thrilling (and more poignant) are his friends’ descriptions of their feeling watching him go—it all floods back to them, all of the fear and anticipation of that event, and the beauty and emotion of that moment. (It provides a much more powerful ending than the one which is notably absent—there is no mention or imagery from 9/11, which is a tasteful, admirable choice.) What’s remarkable about Man on Wire is the degree to which we feel the same way as his friends. I’ve seldom seen a documentary as purely involving as this one, and it’s not a mere case of empathy—quite the opposite, in fact, as I’m deathly afraid of heights and can’t imagine something more insane than what Petit does. But by the end of the film, he has come to represent something more than himself; he’s the dreamer, perhaps foolish beyond all reason, but dedicated and determined and in love with the idea of conquering something bigger than himself. There’s a part of all of us that would like to be like that, and that’s what ultimately makes this rich, moving film so very powerful. When Petit came off the wire that August morning, the question he was asked most was “Why?” In his interviews, he mocks the simplicity of the question as typical American literalism—he did it as an act, a work of art, a thing of beauty. But in the final voice over of this exceptional film, he answers that question, in his own way. Unlike a more conventional documentary, Man on Wire goes on long enough to get that out of him, and that’s the kind of moment that makes the picture transcend its roots. It is a riveting, dramatic, exhilarating story. 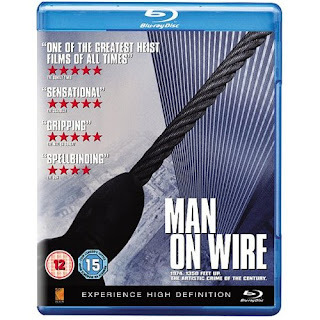 "Man on Wire" was released on standard-def DVD by Magnolia Home Entertainment in December of 2008, but the company inexplicably refused to release a Blu-ray version (even after the film won Best Documentary at February’s Academy Awards). However, Icon Home Entertainment has released a Blu-ray version in the UK which is coded region-free; order it from amazon.co.uk here.